Frost Giants are found inhabiting the Forgotten Vale. They are added by the Dawnguard add-on. There are five of them, each holding a different Paragon. They do not respawn, and are found in fixed locations. Frost giants are much stronger than the normal variety of giants as they have more than double the health, and can cause considerably more melee damage than normal giants. If you plan to fight frost giants, keep in mind that they are completely immune to any form of frost magic, but have a significant weakness to fire. The frost giant holding the Amethyst Paragon is north of the Wayshrine of Learning, up the river along the eastern river bed. The frost giant holding the Diamond Paragon is just outside the Glacial Crevice at the end of the path to the north. The frost giant holding the Emerald Paragon is in the Falmer village. The giant is behind a gate high up in the village along the main path. The frost giant holding the Ruby Paragon is in the Inner Sanctum. The giant is in a passage only accessed by placing the Initiate's Ewer on a small on the western wall in the first room. It will be at the end of the passage. The frost giant holding the Sapphire Paragon is north of the giant holding the Amethyst Paragon. It is up the steps that lead up the mountain. Turn right from the halfway point up the steps and the giant is across the river. The locations of each exterior frost giant are also marked on this map. 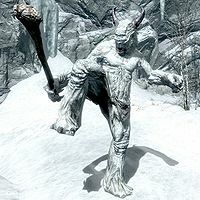 The Dragonborn expansion adds the spirit of another Frost Giant, Karstaag. This page was last modified on 31 May 2018, at 12:51.